Description: Invite rich Gothic beauty and luxurious charm into any home, hotel, restaurant, retail or commercial space with this unique decorative pendant. White art glass panels are high fired and curved to create this stunning shade. 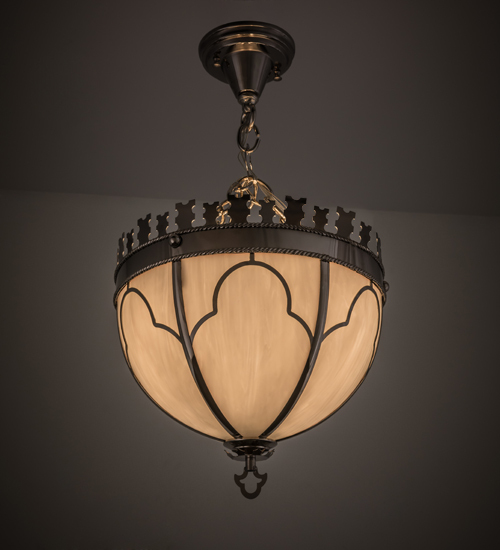 The shade is trimmed with accents in a Polished Nickel finish, to coordinate with matching Solid Brass frame and hardware. Handcrafted in our 180,000 square foot manufacturing facility in Yorkville, NY, using techniques, tools and molds that date back to the early 1900s. Custom colors, sizes and styles are available. Dimmable energy efficient lamping options available. UL and cUL listed for damp and dry locations.